Jungheinrich: "Your Connection To Success"
Under the motto “Your Connection to Success”, the Hamburg-based company presents its products and solutions for Intralogistics 4.0 to international industry professionals. In 2018, Jungheinrich will once again be CeMAT’s largest exhibitor. With over 5,500 square metres of exhibition space, Jungheinrich will showcase its entire product portfolio under the EXPO roof in pavilions 33 and 34. The focus is on the topics of energy, automation and digitisation. “This year, Jungheinrich is the largest exhibitor at the Hannover Messe and CeMAT. We are presenting tailor-made intralogistics solutions that provide the maximum benefit to our customers. Our trade fair highlights include automated vehicles and the latest assistance systems. We will also use the space available in Hanover to exhibit our entire product portfolio. A special feature will be the lithium-ion pavilion integrated in our stand. I invite everyone to discover how Jungheinrich is constantly setting new milestones in the field of electromobility”, states Lars Brzoska, Member of the Board of Management at Jungheinrich responsible for Marketing and Sales. At CeMAT 2018, Jungheinrich will exclusively present the EKX 516a as the newest addition to its automated guided vehicle (AGV) range. 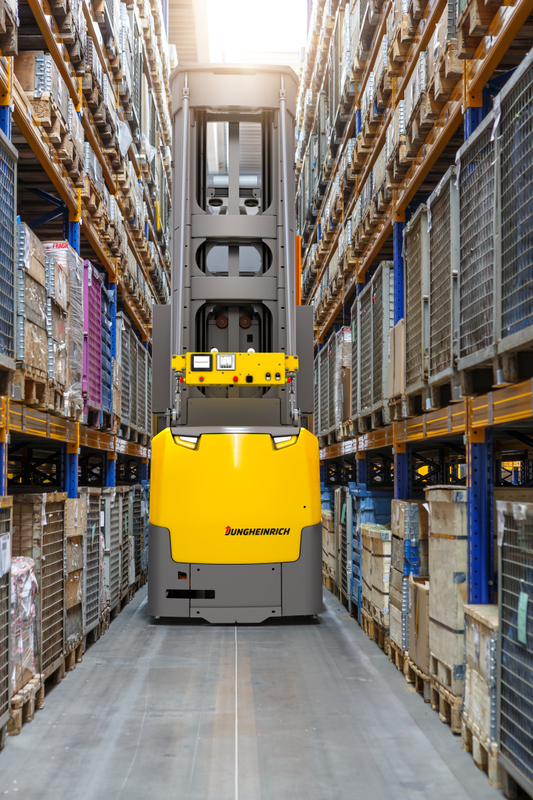 The automated electric order picker is based on the proven EKX 516 tri-lateral stacker with a capacity of 1600 kg, to which Jungheinrich has added automation components. 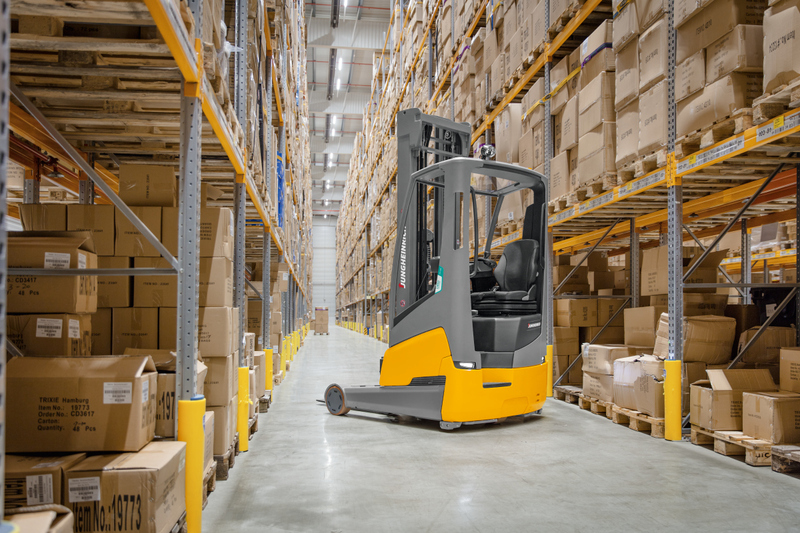 It can be used for warehouse tasks up to a lift height of 13 metres. Using a proven wire guidance system in combination with transponders, the truck is able to position itself precisely at the storage space and can also change aisles. All processes run automatically. Equipped with an 80-volt synchronous reluctance motor, the EKX 516a opens up new performance dimensions while significantly reducing energy consumption. In pavilion 34, Jungheinrich is presenting the EKX 516a as part of a fully automated logistics solution in combination with the EKS 215a automated guided vehicle system. The showcase, which visitors to the Hannover Messe can visit throughout the week, will first be presented on Monday in the presence of German Chancellor Dr Angela Merkel and the Mexican President Enrique Pena Nieto. Jungheinrich has set itself the goal of enhancing the protection of the operators, machines, goods and storage facilities. That’s why the intralogistics expert from Hamburg is presenting its latest assistance systems in outdoor exhibition area 34. The new zoneCONTROL increases safety at the most critical points in the warehouse. The system consists of a radio module on the truck and radio armatures, which are installed at selected locations in the warehouse. A circular transmission field is established around the armature. Depending on the distance to this radio armature, the radio module mounted on the vehicle triggers responses such as braking the vehicle. zoneCONTROL is based on Ultra Wide Band (UWB) radio technology, which allows for even greater accuracy of up to a few centimetres. With addedVIEW, Jungheinrich will present a digital camera-based system for all-round visibility at CeMAT for the very first time. The use of digital camera technology produces much better picture quality even in low light conditions. The driver can choose between forward view, rear view, top view or split screen combinations. Depending on the driving situation and the load, impaired visibility can be compensated as best as possible. Most recently, Jungheinrich is pursuing a new platform concept for its assistance systems that focuses on modularity and the ability to combine systems. The operator should be supported and should not be overwhelmed with disjointed information from different systems. Therefore, the systems run on a common assistance display, but can also be operated independently. Another highlight of the Jungheinrich trade fair stand at the CeMAT is the opportunity to discover the world of lithium-ion. Here, everyone can see exactly how Jungheinrich’s applies its energy expertise to set new milestones in electromobility. One of these milestones is the new Jungheinrich ETV 216i reach truck. It is the world’s first forklift in its class with a permanently installed lithium ion battery as standard. Jungheinrich consistently used the advantages of this space-saving and efficient battery technology in the development of the truck, thereby creating a revolutionary vehicle design. The ETV 216i has significantly improved ergonomics, a great deal more freedom of movement and perfect all-round visibility. The result is extraordinary ease of use and maximum safety in the warehouse. Thanks to its compact design, the truck achieves outstanding agility in the warehouse. Like all lithium-ion trucks, Jungheinrich also offers its customers a 100% satisfaction guarantee for the ETV 216i. Within the first six months after delivery, Jungheinrich customers have the right to a full refund and can easily and quickly switch back to the original technology at any time. Jungheinrich guarantees a simple changeover process without risk. Another highlight in the field of energy competence is the SLH 300i battery charging system nominated for the IFOY Award. This system offers the possibility to charge both lead-acid and lithium-ion batteries via a single battery module, thereby allowing mixed operation of both battery technologies. The charger offers maximum flexibility for users. The charging system impresses with its wide voltage range, numerous selection options and high level of efficiency. Thanks to a carefully conceived range of variants, an optimum price-to-performance ratio can be achieved with the charger for every application: The SLH 300 is available from 15-320 A in 24 V, 48 V and 80 V. Other product highlights presented by Jungheinrich at CeMAT 2018 include the easyPILOT Follow nominated for the IFOY Award and the EZS 7280 28-tonne tow tractor.